With Talex system it is possible to combine multiple payment methods, making it possible to offer several options so that your customers can choose the option that best suits them. If you sell outside of your own country, you can offer different payment methods for the other countries, ie you can offer invoice and prepayment for your own country, cash on delivery and prepayment for another country and the rest can only pay by credit card. Support for payment by card, advance payment to your bank / postal transfer /swish (and and all other pay first mobile apps), cash on delivery and invoice included in all our packages. You can also connect a fee or discount depending on the payment method the customer chooses. If you want to sell an invoice to eliminate the risk that the invoice is not paid you can use the services of ‘Klarna invoice’ by Klarna, Pay invoice by SveaWebPay, Gothia Financial (Pay by Bill) or invoice through Payson. If you want to invoice yourself, you can of course choose if that option should be avalibable for all – or only business and known customers up to a certain amount, and so on. We can also connect CreditSafe Credit for automatic credit check. Please use the contract forms that are linked on our pages, as we have often negotiated better terms and conditions than what you get if you go directly to the respective provider. Klarna invoice and Klarna account and KCO (klarna check-out). Talex is a Gold Partner with Klarna. 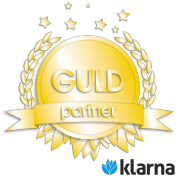 Talex is a Gold partner with Klarna and can therefore offer preferential agreements and pre-installed modules with Klarna in our system. Klarna has built one of the largest transaction databases for online sales. This means that Klarna has invaluable information that allows them to base credit assessments on more than just credit reports and annual income. In this way, Klarna also approve more purchases than any other provider and you therefore sell more! Klarna may cost a little more than others but in the end you earn from it! Support for many other methods i.e Payer, Certitrade, Dibs, Handelsbanken, Klarna Checkout (KCO), PaySon, Auriga/Nets (tidigare Posten Betalväxel), Billmate, Samport och PayPal ingår i alla våra paket. After ordering we will contact you to discuss the details and guide you right. We also have an invoice module with an automatic credit check.